Nate has been surfing around the interwebs again and is having some fun with YABUV5RC (Yet Another Boafeng UV-5R Clone). From all the Baofeng UV-5R clones we've seen in the past two+ years, this gets the prize for being the most "original". - Antenna connector (and a different looking antenna). - The side buttons are both under the PTT, and are both black. - Shape and location of the VFO/MR and the A/B buttons. - And the charger looks different too. Now changing labels and plastic is a very Chinese like thing to do, but changing the antenna connector? This is very suspicious. Then I found the culprit: From the state of Ohio: Universal Radio Inc - apparently, this just appeared about two weeks ago on their website: TDXONE TD-Q8 HT. This radio is also sold on eBay, but get this, only by Americans. Two sellers, one a company called Lentini Communications, Inc from Berlin, Connecticut, and the other is also from Ohio, that not only claims to beat "Universal" in price, but that the radio is graded IP65. There you go, the BaofengGate conspiracy is solved. The domain: tdxone.com belongs to Universal Radio Inc. I believe the eBay seller from Adamsville, OH, is Walter KD8HWG. The radio appeared several month ago, maybe around April. 128+128 Memories, what is that about? This frequency range post here is interesting. Universal talks about the frequency range, but fails to mention that there is a 220 version. The 220/440 versions cover 219-225 MHz, The good people of Universal, left the specs as 245-246 MHz which is really only interesting to you if you want to use it in Thailand. - Is "#" the confirm button? For UV5Rs, you press the MENU button again to confirm an action. - On the bottom left: Scan? What happened to the Monitor function? After examining the users manual (keep reading), I found out that the graphics was misleading, MENU still confirms changes, and the monitor function still exists. Menu comparison chart is here. Users Manual is here (PDF). Anderson Communications from Australia also has it. His version is TD-Q8AH with a "super high capacity battery". From the manual I've learned that the menus are slightly different, and you can change the functionality of one of the side buttons, edit channel names, and the ANI. They also added PL/DCS scanning. But they call it Tongdaxin TDX1 Q8. TDXChina.com carries the name Tongdaxin. And there is the TDX-Q8-silver which has the same case as the TDX-Q8(BH); they might be the same radio. Of-course you have a bunch of the usual commercial radios. This post isnt specifically about the radio, but about one of the companies mentioned in the post. I live in central CT and have shopped at Lentini many times. My father has been a longtime customer there and most people in the area know about them and shop there. They are really good guys. I havent been there in a while so i know nothing about the radio, but next time i go up there i will ask them about it. One thing i do know though, is i remember a while ago i was talking to them and they said that Ebay and other websites have been killing their business as they cannot compete with the prices of the chinese sellers. They were the first major dealer in the area to get into selling wouxuns and chinese radios, which helped them alot, but they still were having trouble competing, so maybe they saw this as a radio that not alot of dealers were selling. I do know that they were excited for the wouxun and anytone radios to come out so they could sell them, which they carry both of them. That being said, they are very honest and good about buisness, and i cant picture them lying about things to make a sale, and you mentioned one of the sellers saying that a radio had a certification that the other sellers didnt mention. I can tell you from knowing them that if they say it has a feature of certification, then it definately does. Also if they did not think that it was a quality radio, then hands down they would not stand behind it and carry it. I'm happy you are a faithful customer of your local ham radio dealer. Ham radio dealers have a very important role in distributing the hobby, which is good. Please read carefully the post again, all I've said was that they mention that the radio is graded IP65 (I'm quite happy to see these things). I did NOT say that they are lying about anything. In the past your only option if you wanted an amateur radio HT, was to get an expensive Japanese radio. Technology changed, and things are cheaper to manufacture. Yes, it doesn't have quite that quality of the Japanese radios, but you know what? for just an HT, I will never pay $250-$400 again (the last one was my VX-7r - R.I.P). The fact is that this is a free market economy, your local dealer had to accept the fact that the market demands cheap Chinese radios, and started to sell them too, (which if you look at their website, they certainly did). eBay is killing their business??? Please, they have been selling on eBay like anybody else, and only in the last month, they have sold at-least 29 items, at-least 850 items sold in the past 12 month. I'd say eBay is good for their business. Anyway the whole point in my post was to show that American companies started making requests, and got their own branded radio, with many things changed not just the labels (which Chinese sellers constantly do), I think it is a good step because the manufacturers in China don't necessarily know what we like and want here in the US (for example - changing the ANI code, and programing channel labels right from the keypad), and dealers here do, so these 'conspiracies' are quite welcome, see the Imported Communications Baofeng F11 - New USA version of the UV-5R. 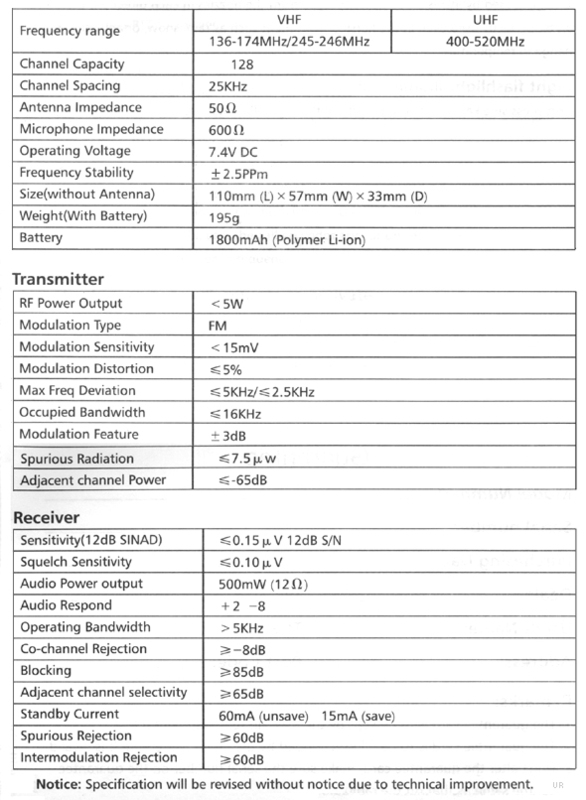 Another example is the 220 MHz radios, they only started making these because of the demand from the Thai and Americas markets (Personally I want to see Tri-Band radios for 144/220/440 MHz come out of China, and I want to see some radios that cover the higher bands as well 900/1200/2400 MHz). You can see this change if you remember that when the Chinese started to mass produce radios, they have dome mostly UHF only radios to cover the demand in China for 409 MHz radios (which is why 409Shop is called that way), and VHF radios for commercial entities (Dual band radios is mostly an amateur radio thing). * at-least 290 in the past 12 month, at-least 850 items sold since they opened the account. Oh sorry if you misunderstood me. I never meant to make it that you were saying that they were lying, i simply meant that if they stated something as a feature, then based off of their reputation and knowledge of them, that i would believe it, unlike alot of the chinese sellers who commonly exaggerate and make things up to pad/inflate their descriptions. Also i wasnt saying that ebay as a whole was bad, just simply that for a time, the ebay pricing offered by the chinese sellers who conduct their business online only were alot cheaper than the prices that traditional brick and mortar shops can offer. It was coming right from the owners mouth when he said that they were hurting his business lowering how much he was able to make off of each radio because he was getting forced to lower the prices to compete (this was back when the economy was even worse than it is now, so his situation may and probably has changed since back when people were doing almost NO unnecessary spending.) What he used as an example was the KG-UVD1P, when he first started carrying them a few years ago, he was selling them for somewhere around $130, when alot of the online sellers were selling them for around $110. Alot of people bought them from other sellers because of the price difference. Because of that, he was worried that he was not going to be able to sell the ones that he invested in (which was a very big expense at the time) and even if no radios are selling, there are still operating expenses in running a business, and he was being pulled pretty tight between money coming in, and money spent running the business. Now though, he carries almost all of the chinese radios, priced VERY competitively, so his investment did eventually pay off, but for a time period, he was worried about having to compete with the other, direct from china sellers. also to get back on track, i too would love to see more dealers taking the initiative and convincing and working with the chinese manufacturers to make radios that fit the demand here in america, and am very interested to see what will be coming next. 1. I was browsing AliExpress to see if I can spot something interesting. 2. It is usual for Chinese sellers to re-brand / re-label the radios, but to change the antenna connectors, is not so common. 3. Looked around and figured out it was an American initiative = American companies that asked the Chinese to do these changes for them, like Ed from Imported Comm got Baofeng to make him the F11 version. 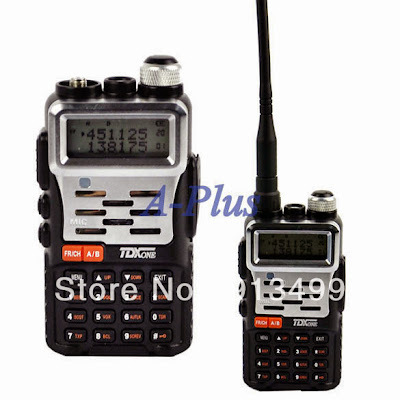 These radios are also being sold on AliExpress as KSUN KS-8R. Warning: Propriety battery (Can't use the cheap batteries or the long/high capacity batteries you can use with UV5R radios and other clones). The same unit is sold in Ukraine and Russia as Voyager Q7 and as someone can see in Youtube (couple of videos), it's really Waterproof (IP67)!! !